Leather Couch with Dogs: A Lament and a Cheat Sheet. Dogs are perfect. They are our best friends, our exercise buddies, our snuggle bugs, and occasionally, our worst nightmares. A certain dog named Sasha Fierce likes to bark from her perch on the couch at 3AM. Kali prefers to smell instead of walk. Copper can’t catch anything in her mouth. Other dogs, who for the sake of their reputation will remain unnamed, ruin furniture. They disobey and put their dirty butts all over your nice white couch. They scratch. They hide bones under decorative pillows. 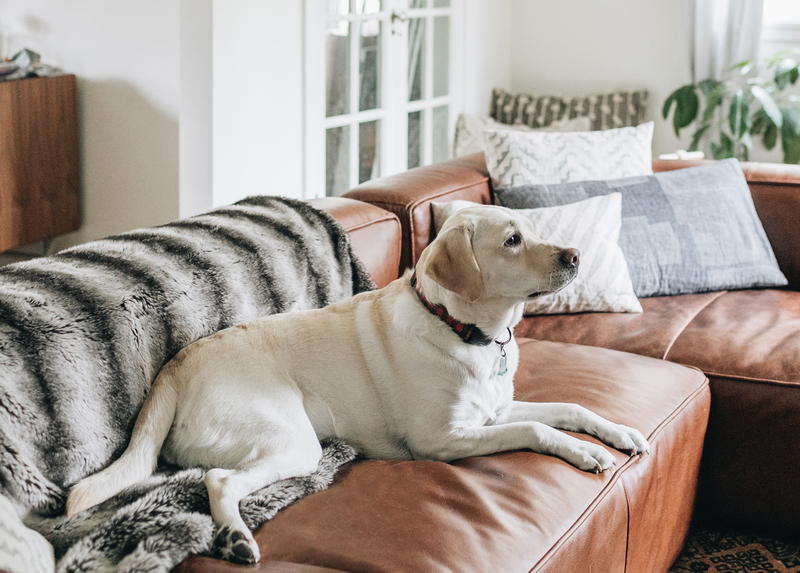 These are just a few reasons for why we recommend a leather couch with dogs. Manicures. Just kidding, but definitely keep your doggy’s nails clean and short. Some leathers, such as our Charme series, look awesome when they get a little marked up. It adds to their overall “I’m a chill leather” vibe. Other leathers, like our Oxford series, present a stronger, more groomed look that can be sullied by a claw mark. While most claw marks can be buffed out with a clean cloth, why not save yourself the trouble? Your local groomer likely offers nail clipping along with a regular cut. Fur control. Dogs shed. Especially if you live in a place with distinct seasons. Every spring your sinuses are blasted by pollen, and your dog brings the party inside by way of shedding their long, fleece coat. Pre-empt the sniffles, and the build-up of dog hair on your leather sofa, by giving your dog a thorough brush. As often as possible. Once a day is ideal, but once a week will do too. It depends on what you hate more: brushing your doggo, or vacuuming every nook and cranny of your couch. The good news is that the hair does just sit atop the leather. In an effort to be more environmentally friendly, we like to remove dog hair by donning a pair of slightly damp rubber kitchen gloves, and running them along the couch seat. Rinse, repeat. Obedience training. If your dog has previously destroyed a couch, invest in some professional training before you invest in a brand new leather couch. No matter how good your leather care is, nothing is going to solve your pooch chewing a chunk out of your Timber sectional. Ground rules. If you’re stronger than the writer of this post, you’ll set some serious boundaries about dogs on couches right away. Giving your dog treats for hanging out on the floor sends a pretty clear message to your dog: floor is good. Picking up a comfy dog bed (pet accessories company Handsome Mountain make some that are more “chic floor pillow” than “dog bed”). A leather couch with dogs could perhaps become a leather dog bed. Hello, I’m really cute. Tony doge in front of our perennial favorite, the Sven. One of the best parts about leather is that it’s pretty easy to clean. 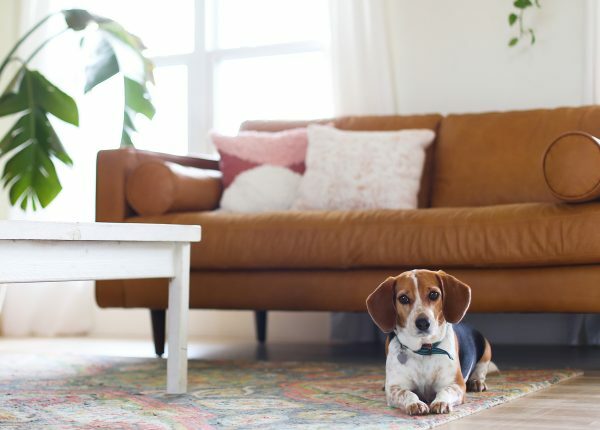 Tanned leather is much less porous than a fabric — if you act fast, you can minimize the damage of a puppy accident. Simply blot the excess moisture with an absorbent cloth. It’s important to treat your leather with something to cut through the urine scent. We like a solution of one part vinegar to three parts water, but deep soiling should always be taken to a leather-cleaning professional. We know it’s tempting to get all “out damn spot!” on the stain, but please take care when washing your leather. You don’t want to scrub leather. Instead, blot and gently wipe in small circular motions. Additionally, remove the cushion-filling and give it a wash. Urine-marking can be a persistent problem if the scent is allowed to linger. While vomit is just as gross, it is easier to clean up. Barf is involuntary. Your dog is unlikely to puke in the same spot twice. Hopefully that offers some sort of peace of mind. 11/10 doggo being contemplative on a Triplo. Are you a dog person who doesn’t yet have a dog? But your commitment to the lifestyle of owning a dog is so strong, you’re pre-emptively investing in a leather couch? We like you. We see you, and we appreciate your foresight. Since you’ve already demonstrated you have good taste in sofas, we wanted to humbly suggest a few dogs that align with different lifestyles. 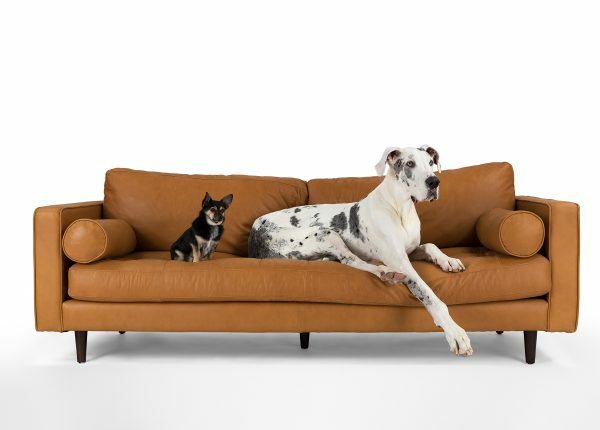 Because ultimately, if you’re going to get a furry friend, we strongly suggest a leather couch with dogs. Australian Shepherds are gorgeous and totally nuts. If you’re into running, hiking, mountain biking, or other high-intensity cardio activities, this dog in for you. While they are super-smart, they are also super-willful and not into chilling at home all day. Get this dog if you want a by-your-side companion who’s always down to RUN. Say hello to your tiny friend. Chihuahuas are a small but mighty companion who loves their people, cuddling, agility sports, and naps. A perfect dog for a busy-but-dog-obsessed individual who lives in small quarters. Remember Roald Dahl’s book “The BFG”? It was basically written about Great Danes. Noble, gigantic, and extremely chill, a Great Dane is actually an excellent apartment dog. Sweet, affectionate, and great with kids, Great Danes do shed, but their short hair makes it easy to maintain. Easygoing, fun, always down to party: the Yellow Lab is the 90s movie star of dogs. Famously friendly, you can rest assured that your lab will bond with the entire family, and probably charm your neighbors too. Two number-one good boys enjoying our Sven sofa. We recommend a leather couch for dogs because leather is tough. It’s easy to clean, it’s puncture resistant. But leather isn’t indestructible. To give your leather couch a good, beautiful life, you need to invest time, care, and a few trips to the professional cleaner. You’ll also need to invest in dog training. Consistency is the key, but consistency + enforcement is easier said than done. We’ve collected all kinds of owner-training-tips — keep closed jars of treats around the house so you can always reward good behavior, for example — but really, the best training tips are the ones that work for you. The good news for your sofa/dog dilemma is that leather wears in, whereas fabrics wears out. Set your expectations and be realistic about your dog. 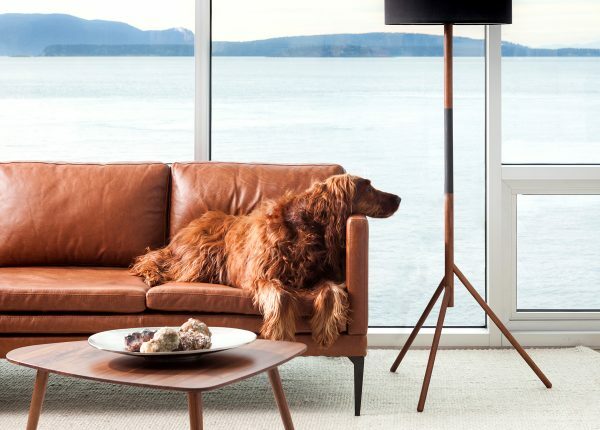 If you know your dog is going to make his couch your couch … go with the Charme leather.